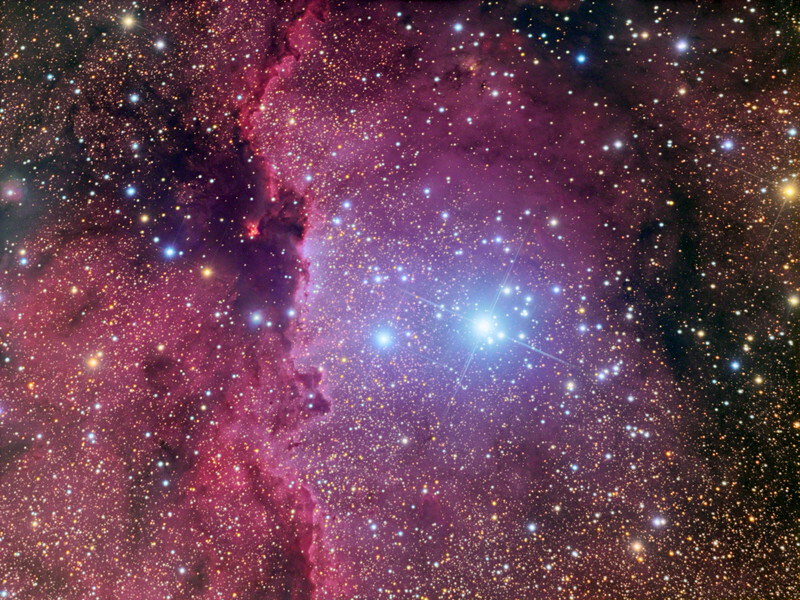 NGC 6188 is a large emission nebula located some 4000 light years distant in the Southern constellation Ara. This giant molecular cloud is being illuminated by the young star cluster NGC 6193 which in this image appears in the centre almost as if suspended in front of a blanket of nebulousity littered with thousands of other dimmer stars in a multitude of colours. At the centre of this cluster lies an intensely bright pair of stars; the O-type giants HD 150135 and HD 150136. The latter is in fact itself an extremely close binary with a confirmed third component in an outer eccentric orbit of between 2950 and 5500 days. This triple star system is one of the most massive in our galaxy with the three components containing 64, 40 and 35 solar masses respectively. The cluster is very young, not older than 3 million years, and the intense radiation from the massive stars is slowly eroding the surrounding gas and dust away, sculpting it into the striking forms seen in this image. Within these clouds new stars are currently being born and in places some have already begun to light up the nebula from within.